Ravalox' Quest Tracker provides A more intuitive QUEST TRACKER than the in-game provided tracker interface. (see screenshots) The interface can be left on the screen or hidden via settings or /slash commands. If the tooltips option is selected, a tooltip window will appear when hovering over a quest. Click on the Category to expand or collapse the list. /qth Toggle the Questtracker UI on or off on the fly. /qtl Toggle the QuestTracker UI lock on or off on the fly. /qta Toggle show/hide Categories and Quest entries on the fly. /qts Show and Expand all Quests only in the Selected Category. /questracker or /qt settings ... Directly access the settings menu. * Fixed error message when addon initialized. QUEST_TRACKER interface appears to be FOCUSED_QUEST_TRACKER now. * Fixed error message when quest changed outside of addon. QUEST_TRACKER interface appears to be FOCUSED_QUEST_TRACKER now. a permanent fix will be made after getting more info. * Bug fix: Hide DFLT QuestTracker was restoring itself on player load. * Added Option to force all quests in Active category open on login. [color #dd0000]Known Issues: v3.3.0.4:[/color] None. * Added a feature to expand all nodes in the list. This feature is enabled in the settings menu, and can be controlled during play via slash command. * Fixed override quest colors where under certain conditions the colors would not display correctly. * Adjusted items in the settings menu for better "flow"
Complete re-write of the addon. The re-written addon has the look and feel of the old version but the mechanics work much smoother and the code is optimized. Migrated Addon to Ravalox' addon catalog. * QT UI flashes on the screen during questgiver conversations (and assorted other times). by mouse. They can still be cycled by "T" key or Journal menu. **NOTE: This addon is currently broken. 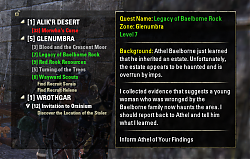 Additional code needs to change to make it compatible with ZOS' quest tracker API changes. This may sound strange, but any chance you could add the timers / extra objective quests to the list of movable UI items at the bottom ? If it's already available, i am unable to find it. 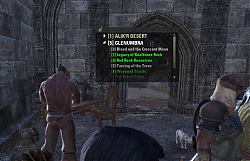 If it's not already in the UI settings, you can find it by doing the Thieves guild daily quests. I am asking it because then i can move the minimap in the top-right part of the screen, with the quests underneath. I would prefer if quests timers and extra bonus objectives would be added to this addon, considering it modifies quest related stuff, rather than having to go and find another addon that modifies all the UI items, i am using LUI, and that doesn't have the ability to move timers either. Last edited by bluepitbull13 : 03/03/19 at 11:13 PM. I meant to reply to this, but got side tracked looking at other items. I like the idea, but it will take some investigation to see if I can pull it off. I love this addOn, thank you! I was curious about the same thing. The only additional thing I'd like to see is the ability to select which category/zone you want to view, so the quest list isn't so large when you are trying to focus on one area. Does this error make any sense to anyone? Whenever I try to right-click on any quests on the quest tracker I get this error and then it breaks the other context menus. I did skim through this post but was unable to resolve anything. Error goes away when I disable Ravalox. Love the mod tho! Aye, I'm experiencing the same thing with the same results. I think the updates to LibCustomMenu in the update just posted will resolve this issue. Let me know if you encounter this post update to 3.8 addon. Last edited by snoozen : 01/16/19 at 11:02 PM. Great addon I love it. Have it setup like most other MMO's etc have it. For the levels I'm in Summerset and its showing all levels as my character level and yellow. 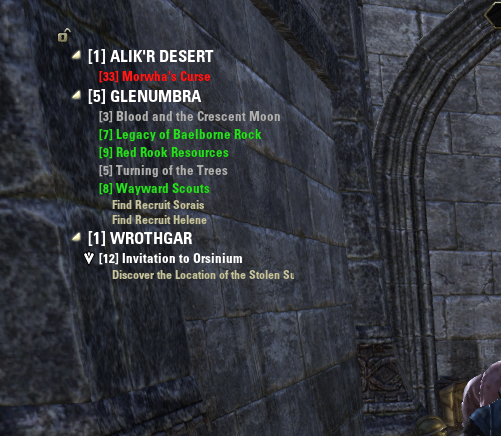 I checked someone house and got the first main non expansion story quest 'Soul Shriven in Coldharbour' accidentally as I am staying in Summerset for a bit then I'll branch out. However that is also showing yellow at my level of 22. I would have thought that would be showing the correct level. So wonder if that feature got broken or is bugged or I am missing something to show the levels properly. I don't know this for a fact, however, I presume the reason everything shows as yellow is because all quests are technically the same difficultly relative to your current level due to the battle-leveling that takes place until L50 (since the One Tamriel update). As such, regardless of your level, all quests are always "moderately" or "yellow" difficulty. Yea should have thought it was the battle scaling one tamriel that did it. One thing that's been frustrating is the ordering of the tracker. When I T through them it jumps all around, I assume its when I picked up the quest or something else affecting it. When I cycle through them with T, the categories open in order but the active quests in a category it doesn't cycle them in order top down which is annoying if I have 5+ quests to see the active cycled quest jump around up and down through the list. 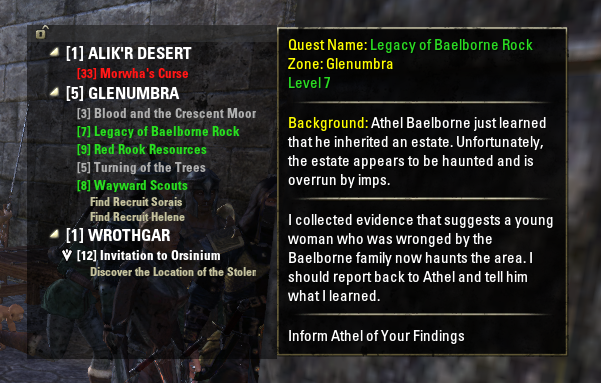 The Journal cycles quests in order through the categories though. I worked out the above was done by level order which made pressing T jump all between the quests in a category but didn't re-order the quest list. 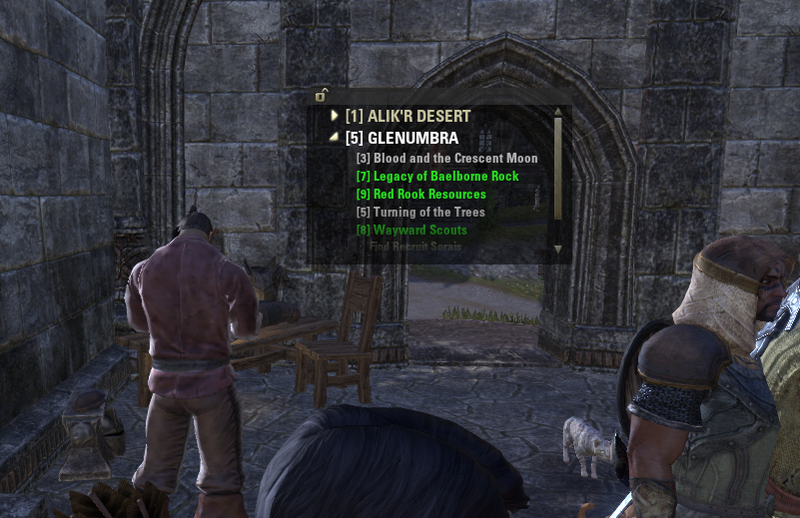 As below we worked out it's the One Tamriel scaling option causing quests not to have levels anywhere and as a result the order gets messed up when quest level ordering is on. So for me I turned off ordering and quest numbers as those options are not relevant. Last edited by drguild : 12/17/18 at 10:27 PM. Last edited by ZoLatKam : 12/13/18 at 06:15 PM. 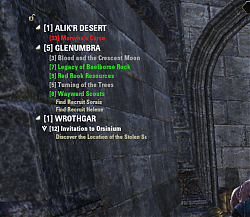 I checked someone house and got the first main non expansion story quest 'Soul Shriven in Coldharbour' accidently as I am staying in summerset for a bit then I'll branch out.